This 2-bottle wine tote is terrific for my business. We customized the bag just the way we wanted & dealt with great customer support from the CEP team. Thanks. Thanks for doing business with me CEP. Very affordable bag that was great for my girlfriends business. 5/5 review. Arriving in a subtle natural canvas color, your brand will stand out vividly from the bag, maximizing the chances that potential customers will see it! The bag also includes outside pockets for more carrying space in addition to the 3" gussets in the main compartment of the bag. Whatever your customers end up carrying, comfortable handling is ensured due to the 14" handles. This bag is made to be both trendy and durable! If you are looking for a sturdy yet stylish bag, look no further than the Heavyweight Cotton 2-Bottle Wine Totes! Made of 14 oz cotton canvas, this is a very resilient bag that is resistant to normal wear-and-tear. Its strength is also bolstered by a sewn-in divider and its versatility is increased due to the addition of convenient outside pockets. Finally, a sizeable 4" W x 5" H imprint area is included where you can showcase your brand with the message or design of your choice! Our collection of Heavyweight Cotton 2-Bottle Wine Totes is among the most versatile and durable options on the market today! Its most distinguishing feature is the 14 oz thickness with which the cotton canvas is made. As a result of this durability, this bag is not subject to rips or normal wear-and-tear. It is also made with a sewn-in divider which provides more stability. 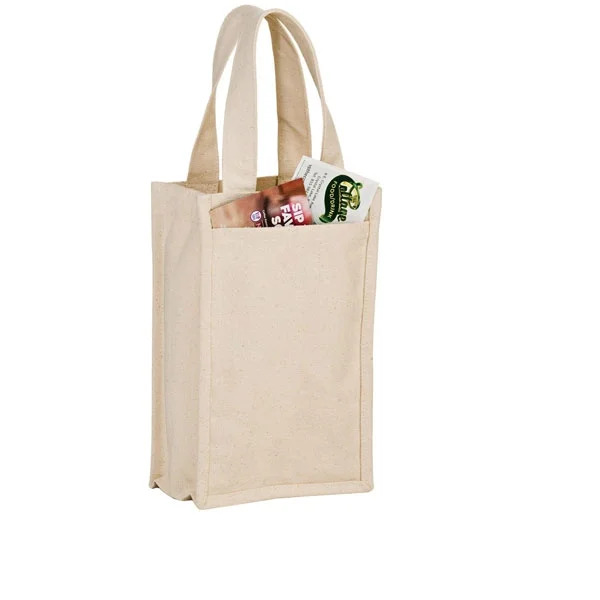 The divider also increases the functionality of the bag in that your customers will be able to separate their contents within the spacious interior. It does not sacrifice aesthetic appeal in the process, however. It comes in a subtle natural canvas color and includes trendy outside pockets for increased carrying capacity. This bag includes a sizeable imprint area which contrasts nicely with the natural canvas color of the bag! Finally, this bag is made of cotton which is notable for its sustainability, versatility, and eco-friendliness. No harmful chemicals or pesticides are used in the production of this bag. By purchasing this tote bag, you are in turn sending a positive, green message to your customers and potential customers alike! At Custom Earth Promos, we pride ourselves on delivering each product within the required time frame and providing superior customer service. We work with our overseas manufacturing facility to ensure that each product is tailored to your exact specifications and is delivered in a timely manner. We provide only the highest-quality products at the most competitive rates in the business!